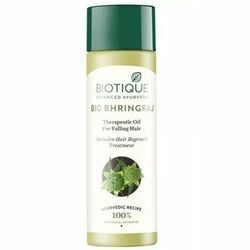 BHringraj Oil from Biotique. We supply Bio kajal and complete range of cosmetics from Biotique. We are offering Bio Bhringraj oil 120 Ml and 190 Ml. We are engaged in supplying Biotique Hair Oil. We are offering Biotique Hair Oil. We are supplier of Biotique Hair Oil. We are dealing in Biotique Hair Oil. We are amongst the most reputed names in the industry, offering Bhringraj Hair Oil. 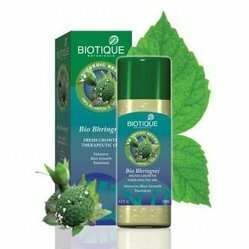 Control hair loss with Biotique Bhringraj Fresh Growth Therapeutic Oil which is infused with natural ingredients which help in nourishing the scalp and help control hair fall. We are unique supplier of Biotique Hair Oil. This luxurious oil is a blend of flame of the forest flowers and extracts of hibiscus to promote healthy hair shine and body. Fortifies follicles against damage. Keeps color and perm in place. Leaves hair full of life and luster.